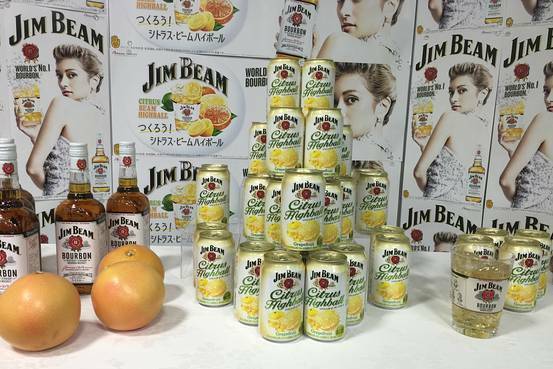 Those of you tired of hearing the term “Craft Cocktail” might be happy to know Jim Beam is keeping it classy with a release of their new ready to drink cocktail in a can, Jim Beam Citrus Highball. Now TECHNICALLY, pre-bottling cocktails is pretty trendy now too, but typically those are still pretty fresh and thus put your typical ready to drink brand to shame. I still remember back in my college days as a liquor store clerk when we had Captain and Cola, Beam and Cola, and a 7 and 7 in a can. They sold, but not often. Jim Beams shot at another canned cocktail this time comes after they claim a huge spike in citrus highball popularity at bars and restaurants. So naturally the answer is to pre-make them right? Blah. To each his own I guess, I’d be lying if I said I’ve never had one. Desperate times call for desperate measures. This is the first official collaboration between Beam Suntory’s Japan and U.S. teams, but Suntory has been promoting the Citrus highball cocktail style since last year.